Peace & Love & Jigs & Reels brings you Celtic music on Irish flute, whistles, alto flute, guitar, bodhrán and Afro-Irish drums — all with contagious energy, whimsy and tenderness. 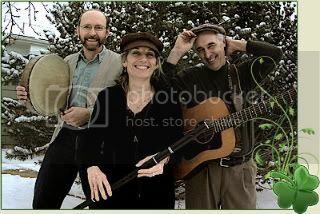 As a duo, Gregg Hansen and Cynthia Jaffe have been heard at major festivals throughout Colorado, including the Long's Peak Scottish Irish Festival, Gaelic Highland Festival, Crestone Music Festival, the Festival of the Mabon, and Swallow Hill Folk Festival. Now as a trio joined by Steve Wharton on bodhrán, the energy is even higher. From soulful slow airs to spirited arrangements of traditional and original tunes (not to mention Celtic Beatles), your heart will have a “brilliant” trip, as the Irish say.